Hi Guys, yes we're still stuck in review...for now! Things are moving again, at least I think they are, and we're making some progress at last! Well, it was always going to be wasn't it? It's never easy moving to a new system and you know what they say...no pain no gain! I'm feeling a bit more optomistic this week, I think we're now starting to make some real progress so as far as that goes it's...all good! On the down-side, Coo's not been so fortunate, he's been real poorly this week. He's very sleepy and it's been difficult to keep him awake so we've had lot's of seizures yet again. The temperature and weather changes from one day to the next, hasn't helped things either! I mean, one day it's really sunny and hot and the next? Well...it's all grey, overcast and rainy! It's fair to say, it's been pretty much a bit of a mixed bag weather-wise, well, here anyways! dig out your brolly and boots time yet again - woo hoo! 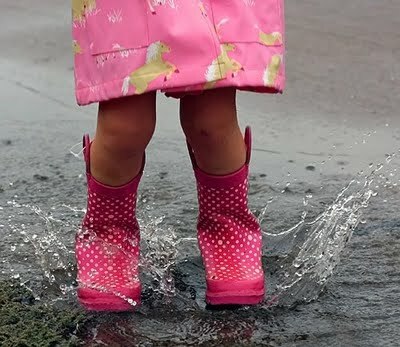 It's just as well, I like splashing about in puddles like a big kid isn't it! Now before you laugh, you should try it! Honestly - it's got a kind of therapeutic effect and it's probably really good for lowering your stress levels too - go on you know you want to! Happy Days, from a splish-splashing Maz! Even if the weather isn't quite what you'd like for June enjoy it anyhow! Hi, Thanks for visiting my blog. I have not been to visit anyone in so long. But had to ck in. I am sitting with a lady who has sieziers . She has had two since I started working with her. A little scary but not bad. I am thinking of you two. Blessing always. I like splashing in the water too. (((hugs))) Karen thanks for stopping by! Take care of you too karen!